Description: Union Pacific 4285 north leads a freight at 21st Street in Tacoma, crossing over to main 2. Description: UP Eastbound Freight Train at Summit, Ca. 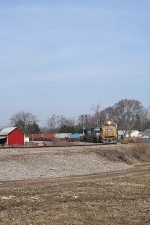 Description: Third of three units on a northbound UP intermodal train. Description: The ZLCBR passes through Eugene yard after a quick crew change. Description: UPRR Fort Worth, TX to Kansas City, MO train MFWKC-20 - UPRR Choctaw Subdivision. Description: A set of UP power sits at UP's Service Tracks aka "The Mudge." Description: In the siding to meet its counterpart, ZMXYC. Description: UP 3946 and UP 4285 leads a northbound freight over Water Street at Chester.